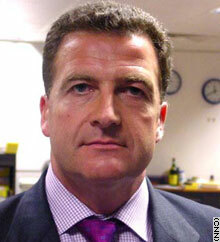 John Nichol is now a writer and broadcaster. This is the kind of abuse I suffered in Abu Ghraib ... it's horrifying to think that American and British forces could do the same ... 13 years after the event. LONDON, England (CNN) -- As controversy swirls about images allegedly showing U.S. and British soldiers abusing Iraqi prisoners, CNN anchor Monita Rajpal spoke to John Nichol, an Royal Air Force navigator who was shot down, taken prisoner and tortured during the 1991 Gulf War. RAJPAL: What goes through your mind when you see these photographs? NICHOL: Two reactions: obviously we're still questioning whether the British photos are real or not, but it doesn't really matter because the damage has already been done. But specifically with the American photographs coming out of Abu Ghraib, a prison that I spent some time in during the first Gulf War in 1991 -- a brutal place, a horrific place. I feel saddened that British or American forces would commit such acts on prisoners -- regardless of what those prisoners have done. I heard someone saying on a news channel coming out of the United States that those are the sorts of things that the Iraqis would do to us so it doesn't matter. But that's no justification. We went to Iraq to say our standards are better ... we are coming to bring democracy ... we are coming to stop this abuse. This is the kind of abuse I suffered in Abu Ghraib and it's shocking and horrifying to think that American and British forces could do the same to Iraqi prisoners 13 years after the event. You were tortured in Iraq. Is there a sense that this is the way things are done in a prison? No, this is absolutely not the way things are done in a prison. It's the way things were done in the past in Abu Ghraib and it's the way things should not be done by the Americans and British. So what does this do to the hearts and mind then? The hearts and mind battle in Iraq is being lost. Thirteen months ago the U.S. military with Britain at its side liberated Iraq from repression. But we seem to be losing the peace. Tragic numbers of American soldiers (were) killed in the last month. It's a tragedy that 13 months into the peace we're seeing so many losses. For America and families watching the news it must be a truly tragic, upsetting time for them. Human rights groups are saying this is just the tip of the iceberg. They've been making allegations since last summer of abuse at the hands of American and British soldiers. But when we're talking about interrogation, some American soldiers are saying this is a tactic that was approved by certain governmental agencies, the CIA the FBI. It's an interrogation tactic -- what do you say about it? If it is approved, it's illegal and it's a war crime. It is what happened to us in 1991 and it is completely and utterly unacceptable for any modern military to interrogate people in that way. The military can interrogate people, but interrogation means questioning, not torture. Brutality, which is the sort of thing seen in those photographs, is completely unacceptable. Even if you say some sort of oppression is acceptable, what is going on in those photos shown on the (CBS) 60 Minutes program is not oppression, it is humiliation. That was someone enjoying the cruelty of demeaning prisoners -- that's not about interrogation, even if you say some sort of brutality is acceptable, which of course it's not. Putting aside the rights and wrongs of this, paint for me a picture of what it's like to be a prisoner at the hands of such abuse? What is difficult for people to understand about being a prisoner of such a brutal regime is that you have no control. You have control taken out of your hands. I was beaten, burned and abused. All of this things cause physical pain to the body -- there's no doubt about that. But the greatest thing is fear: fear of the unknown; fear of footsteps coming down a corridor; fear of listening to other people scream; fear of not knowing whether it's going to happen to you next. That's the reality of existing in amongst that violent, hateful regime. It is the fear of not knowing whether you're going to be alive in a minute, in a day or in a week.